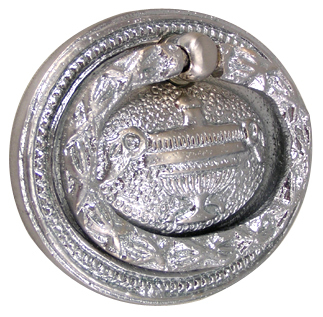 2 7/8 Inch Solid Brass Victorian Oval Lamp Ring Pull - measures 2 7/8 inches long and 2 1/8 inches tall. Comes complete with one rear mount machine screw. This item is shown in a Brushed Nickel finish. It may be available in several other designer finishes as a custom order.